The deal had looked off after Brendan Hell-Wood said that he wouldn’t accept much under £2 million for the player and he looked all set for a move to <?xml:namespace prefix = st1 ns = "urn:schemas-microsoft-com:office:smarttags" />Norwich when Bryan Hamilton agreed a deal but the Clarets stepped in and got him for less than we had offered in the first place. 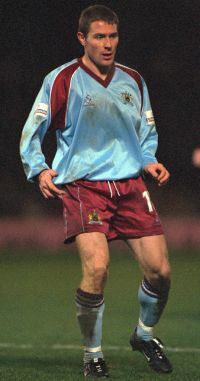 It was this deal and the amateurish work by Stockport that won them the award of Unprofessionals but it left Moore a Burnley player, ready to strike up a partnership with Andy Payton. We’d started the season with Andy Cooke and the newly signed Phil ‘Tippy’ Gray up front but both had gone and Payts was back with Graham Branch alongside him and loan player Paul Robinson waiting in the wings. Ironically Moore made his debut against Norwich, coming on as a substitute for Lee Briscoe in a game where Payton scored in a 2-0 win. A week later and he partnered Payton for the first time with the Clarets recording a 1-0 win courtesy of a penalty converted by the leading scorer. The partnership was not to succeed though as Payton fell out of favour and they only started six games together of which four were lost. 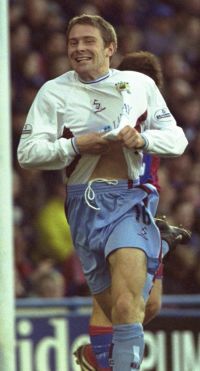 The first of those defeats, at Preston, saw Moore score his first Burnley goal with a superb effort from the left, and at a ground where he had been sent off earlier in the season following an incident that saw David Lucas stetchered off. He found himself a new partner in the last third of that season with Welsh international Gareth Taylor arriving from Manchester City but he struggled in front of goal and netted only six times in twenty-seven league games. The fans had taken to him though with his pace and work rate and goals were promised. 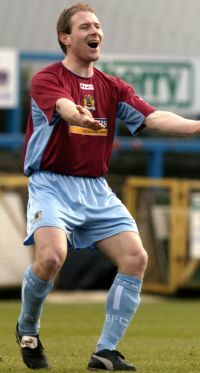 The Clarets soured to the top of the league and had two fantastic spells that season, Moore probably turned in some of his best performances when he played as a lone striker with such as Glen Little and Alan Moore supporting him. Away performances are easily recalled at such as Bradford, Birmingham where he scored a stunning goal, Crystal Palace and both goals in a 2-1 win, and that 3-2 victory at Deepdale when he had such a good game despite missing the header as the ball rebounded to him following Alan Moore’s long range effort. He played in every single league game that season and scored ten goals as we fell short of the play offs by just a solitary goal. The cash crisis hit the Clarets and the top of the league days were over but there was competition up front now for him and Taylor in the fit again Robbie Blake. Mind you Blake started the season with diving boots on so it was same as usual as we lost the first four games. At times that season he found himself playing out wide on the right, a position he clearly didn’t enjoy, but when Stan Ternent decided to employ a 4-5-1 system it was Taylor who got the nod for the striker role. He played more often than Blake though and missed only two games but again he disappointed with the goals and netted just eight in the league and ended the season facing suspension having been sent off against Sheffield Wednesday as we well and truly threw one in. It had been a different story in the FA Cup, in the 2001/02 season he hit is only hat-trick in a 4-1 win against Canvey Island and got a couple against Grimsby in the following season before adding one against Premiership Fulham. As Burnley’s squad dwindled over the following two years so the competition for places was all but none existent. In what proved to be Stan Ternent’s last season in charge it was virtually Blake and Moore up front all season. He missed the first couple of games through suspension and a handful at the end due to a rare injury as the Clarets successfully fought off relegation with two crucial late wins. Again FA Cup goals came his way, this time a couple against Mansfield, and in the current season he did it again getting both in the 2-0 win against Bournemouth. He played for long periods this season in wide positions as new boss Steve Cotterill went with a 4-5-1 system but has shouldered much of the front line responsibility since Blake went to Birmingham. He’s failed to get the goals though and hasn’t scored a league goal on the Turf since the opener against Stoke in September. We’ve struggled to get goals all season and the pace he once had seems to have deserted him. His dad hinted recently when the Clarets took on Sunderland that ‘Our Ian’ wouldn’t be around Turf Moor for much longer. He said he didn’t enjoy playing in wide positions and with coming to the end of his contract would look at other options. This week it has been revealed that there wasn’t to be another deal for him and all of a sudden he had clubs aplenty to choose from. Sheffield United were the first to declare an interest as Neil Warnock looked to continue his hobby of collecting strikers, and then came Sunderland and Leeds along with one of his former clubs Nottingham Forest. Apparently the Sunderland offer was the best one for Burnley in monetary terms but they wanted him only until the end of the season. Instead he opted for Leeds and a deal until the end of 2006/07 working alongside Sam Ellis again as he looks to displace the likes of Rob Hulse, Marlon King and David Healy. Leeds at three other strikers currently on loan elsewhere in Brian Deane, Julian Joachim and Michael Ricketts. Mooro is set to make his debut for his new club in a reserve match next week when they take on Manchester City at Wakefield. Kevin Blackwell claims he has got himself a 15 goals a season striker but Moore’s best season at Burnley saw him score just ten league goals. All in all he has bagged 37 league goals for the Clarets in 192 appearances, a goal every 5.2 games. Always popular with the Turf Moor crowd and the ‘Ian Moore Moore Moore’ chant but as he struggled to find any sort of form this season it was probably the right time for him and club to move on. We would like to wish Ian all the best at Leeds.